Ever go to water your houseplants and see a cloud of tiny black flies skimming over the surface of the potting soil? These pesky critters are probably fungus gnats. 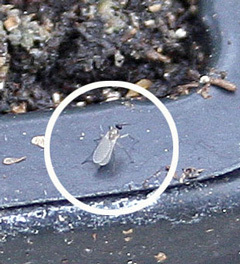 Fungus gnats are common pests of indoor plants. They are not only annoying but they can damage to your houseplants, vegetable seedlings, and greenhouse plants. 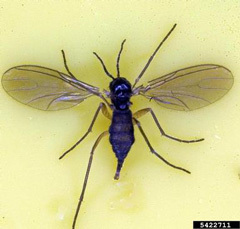 Fungus gnats are small flying insects that look sort of like mosquitoes but they don’t bite. In fact, adult fungus gnats live only about 7-10 days and do not feed. It is the immature larval form that can cause damage to your plants. 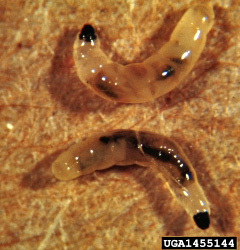 Fungus gnat larvae are slender maggots that thrive in moist potting media. They feed on organic matter in the soil such as decaying plant material and fungi but may also consume the fine root hairs that absorb water and nutrients to feed your plants. When these tiny root hairs are destroyed, it is harder for the plants to absorb water and they may become wilted. Fungus gnat larvae sometimes feed on the main plant roots as well and can eventually make their way into the stem causing small plants to fall over at the soil level. 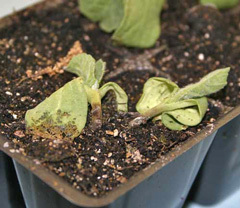 Young plants and seedlings are especially susceptible to damage from hungry fungus gnat larvae. Fungus gnat larvae feeding on the roots of a greenhouse plant. The life cycle of the fungus gnat from egg to adult fly is normally completed in about 4 weeks. Unfortunately, the larval stage, which causes the most damage, makes up the majority of the life cycle, lasting between 12 and 14 days. Outbreaks of fungus gnats often occur indoors during the winter months. They can be introduced when tropicals and houseplants that have been growing outside all summer are brought inside for the winter (fungus gnats are not just indoor plant pests). Eggs and larvae may already be in the soil and will continue to develop in the warmth of your home. One of the best ways to prevent an outbreak of these pesky gnats is to avoid overwatering your plants. 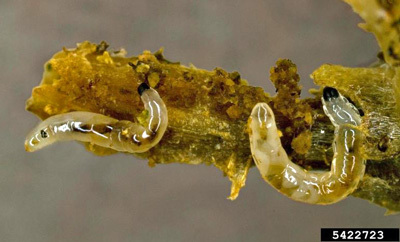 The larvae thrive in moist soil that is rich in organic matter – they cannot survive in dry soil. Allowing the top few inches of the soil to dry out between waterings will not only destroy existing larvae but will make your pots much less attractive to adult gnats looking to lay eggs. 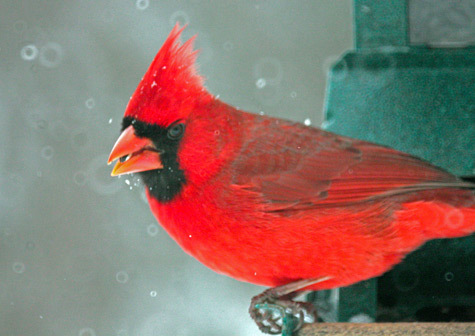 It is important to alter your watering practices during the winter. Generally indoor plants enter a period of reduced growth during the winter and thus require less water. If you continue to water them according to your summer schedule, you will probably end up overwatering. Overly wet soil not only increases the likelihood of fungus gnat outbreaks, it also promotes disease problems. In general, water your plants when the top inch or so of the soil has dried out and be sure to dump any standing water from pot saucers. gnats feeding on roots and stems. February and March is the time when many of us are beginning to think about starting vegetable and annual seeds indoors. Because young seedlings are particularly susceptible to damage and even death from fungus gnats, we must be particularly careful to guard against an outbreak. Always use a fresh, good quality potting mix when you start your seeds and be careful not to overwater the seedlings once the seeds germinate. This will also help to prevent fungal diseases that cause damping off of seedlings. I already have an infestation! What can I do? the edge of a flat of seedlings. The trick to controlling an outbreak of fungus gnats is to disrupt their life cycle. If you destroy the eggs and larvae, you will be well on your way to eradicating the problem. You can do this by following the same cultural practices as you would to prevent an outbreak. Since the eggs and larvae are generally found in the upper two inches of the soil and both stages require moist conditions for survival, let the top few inches of the soil dry out before you water. This should help kill most of the eggs and larvae. Another trick is to spread about ½” of sand over the surface of the potting soil. This not only discourages the adult fungus gnats from laying eggs, it also traps new emerging adults in the soil because they are not able to crawl out through the sand. 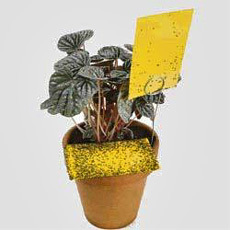 Yellow sticky cards can be used to trap the adult fungus gnats. These are effective but are used more often in a greenhouse situation than in the home because they aren’t very attractive – especially when they become covered with dead gnats! For biological control, the naturally occurring soil bacterium, Bacillus thuringiensis subspecies israelensis (Bti) can be added to the soil as a drench. This bacterium is a different strain than the B. thuringiensis kurstaki strain (Btk) that is used for the control of foliage feeding caterpillars. Bti is used for the control of mosquito larvae in standing water in addition to its use as a soil drench for killing fungus gnat larvae. It is important to choose the correct strain of Bt and to read and follow the label instructions! Chemical control is usually not warranted for fungus gnats unless the solutions mentioned above fail to control them. Bonide Systemic Houseplant Insect Control is listed for the control of fungus gnat larvae when used according to the label directions. 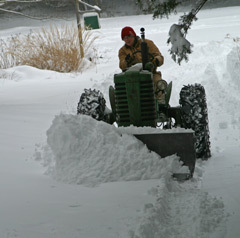 Plowing with my 1948 John Deere Model M. Thanks Grampa! What a beautiful snow we had last night! It started out yesterday evening and continued all night. We woke up to 15” of beautiful snow this morning. It continued to snow lightly most of the morning but stopped for a while in the middle of the day. 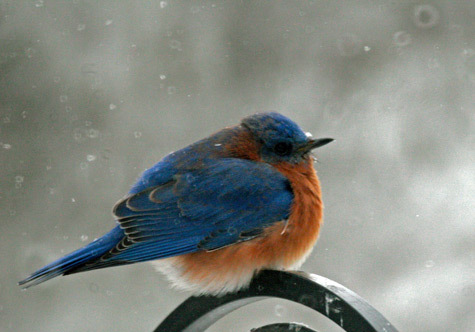 It has just now begun to snow again – pretty hard, too. Rats, right when I just finished plowing the driveway with my old John Deere tractor. Oh well I don’t care – it’s beautiful out. I love snow! 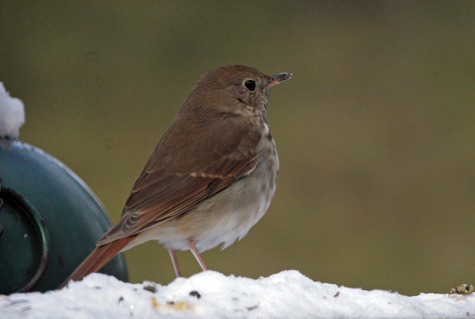 There were loads of birds at our feeders today. 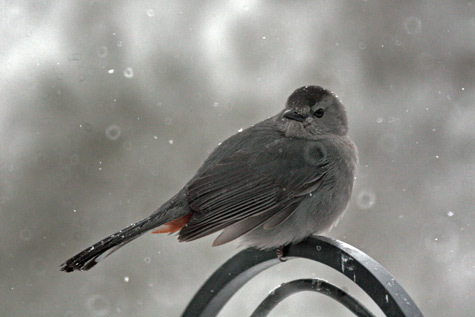 We spent much of the morning in our cozy sunroom with the fire going, enjoying our “snow day” with the birds and hot coffee. What could be better? 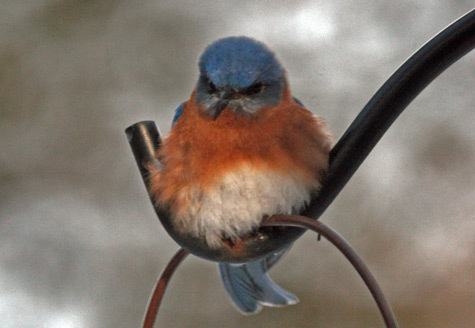 Bluebirds at the water while finches feed on the snow above! Eric had to shovel out around the water bowl so the birds could get to it. 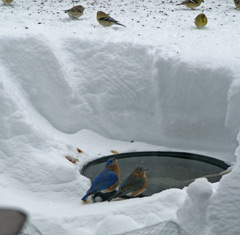 Poor birds, there was no way for them to get to the water because there was a 12” wall of snow straight up all the way around the bowl! Once they had an approachway, the birds were able to fly in to get a drink. 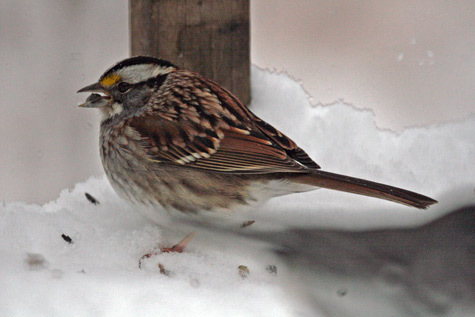 Below are some photos Eric took with his 500mm lens. Gorgeous! What a way to spend a snowy day! Until next time – Happy Snow and stay safe everyone! What is the story on spreading coffee grounds in the garden? This has been the subject of much discussion in the gardening world. Some say they’re great and some say they’re good but with a word of caution. I have read that spent coffee grounds are a good source food for those raising worms. Would it be a good idea to add spent coffee grounds to raised vegetable beds during the winter months, knowing that the present worm population will break them down before spring planting time? From almost everything I have read, it seems that coffee grounds are a great addition to the garden. They can supply important nutrients to the soil; nitrogen, phosphorus, potassium, magnesium, and copper. They also improve the soil structure because as they decompose, they release humic acid which acts as a glue to bind tiny soil particles together into larger aggregates, which improves drainage and air circulation. This is especially good for clay soils. Okay, so coffee grounds can be good for the soil. Now the question becomes, what is the best way to use these grounds that will provide the greatest benefit to your plants? It seems that coffee grounds are most beneficial to plants after they have been broken down by microorganisms in the soil. Though potassium, magnesium, and some of the phosphorus and copper are available to plants immediately, the nitrogen in coffee grounds is not available to the plants until it has been broken down into a usable form by soil organisms. sits beside the coffee pot. For this reason, adding your coffee grounds to a compost pile and letting the soil critters break it down may be the most efficient way to use them. 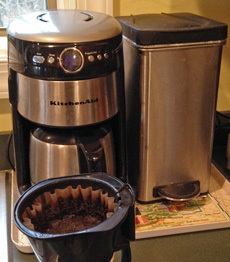 We have been composting our coffee grounds for many years, filter and all. It all breaks down. 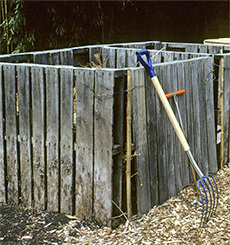 The grounds are a great addition to a compost pile because they are high in nitrogen – around 2%. In the composting world, this means that they are considered a “green” additive; similar to grass clippings. This is great for us because our compost pile is usually a bit “carbon” heavy since we add so many leaves to the pile in the fall. Anything we can throw in that will add more “nitrogen” to the pile is welcomed. It is best to try to keep the carbon to nitrogen ratio at around 25 or 30 to 1 for a healthy compost pile. As an added bonus, worms love coffee grounds and in a compost pile, the more worms the better! Some people that maintain worm bins add a cup or so of coffee grounds to the bin once a week. But wait – aren’t the coffee grounds acidic? Won’t they lower the pH of my garden soil or compost? This is one of the greatest concerns that people have with putting coffee grounds in the garden or compost. It turns out that, contrary to popular belief, most spent coffee grounds are not very acidic at all. The acid in ground coffee is water soluble so most of it is leached out into the coffee that you drink – making your coffee quite acidic and the leftover grounds just slightly acidic with a pH of around 6.2 – 6.8. Coffee grounds should not comprise more than 25% of your compost pile; but that would be a lot of coffee grounds! We average one pot of coffee a day so there is no danger of us overloading our big compost pile with coffee grounds. People who collect used grounds from coffee shops could potentially accumulate enough to cause a problem in a compost pile – they just need to be careful to add enough carbon-rich ingredients to maintain the optimal C:N ratio. Used coffee grounds can also be broadcast right on top of the soil. If they are then tilled or scratched in, the worms and soil microorganisms can get to work on them faster to break them down and release the nutrients. 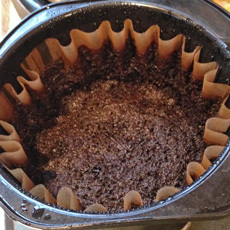 Coffee grounds are a great soil amendment especially if they are composted first. They should not be used as a substitute for fertilizer. Organic fertilizers like the Espoma “Tones” are slow release and also add organic matter to the soil. It is always a good idea to have your soil tested for pH and nutrient content before adding chemical fertilizers and lime to the garden. Good quality compost is always a wonderful addition to your garden soil.